Mark and I are on a new diet. We basically eat anything that you can make in a toaster oven or in a Keurig. For the next 5 weeks, we’ll being using this “makeshift kitchen” that we set up in our dining room. Since I don’t cook (and Mark loves Wendy’s) this arrangement should suit us both just fine. It’s a bit bigger than a traditional galley kitchen, but we think a sleek galley look will make the best use of the space! I think we’ll be able to do the demolition in one day. Let’s hope the rebuild goes just as fast. → Ugly paneling and hidden treasures! Can’t wait to see this project! We were just talking about plans to demo our kitchen. So. Darn. Excited. I’m sure you’ll inspire us! Thanks woman! 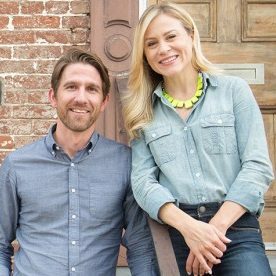 At the rate we’re moving, you and Dan will renovate your kitchen and be on your second house before we’re done! !